Catherine Troyan, daughter of Brian and Nina Troyan, born September 7. Many years! 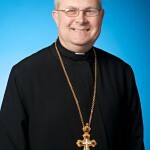 Archpriest William (Bill) Evansky was appointed Chancellor of the Archdiocese of Western Pennsylvania, effective July 16. Archpriest Mark Meholick was appointed as dean of the Johnstown-Altoona Deanery of the Archdiocese of Western Pa. on September 21.